During the day, the cows are let out into the field on a farm on the Bruce Peninsula in Ontario, Canada where they graze amongst the dandelions. The dandelions span for miles providing a brilliant glow to the landscape where some cows rest while others stroll about looking for the right patch to feed on. The Bruce Peninsula extends north from Owen Sound to Manitoulin Island where many areas are pleasant rural farming areas which is one of the most important components of the economy. A majority of the farms are family owned and operated with 62% of the land mass being dedicated to the agricultural industry. This field of cows will eventually make the owner of the farm some good income in the Ontario beef business. 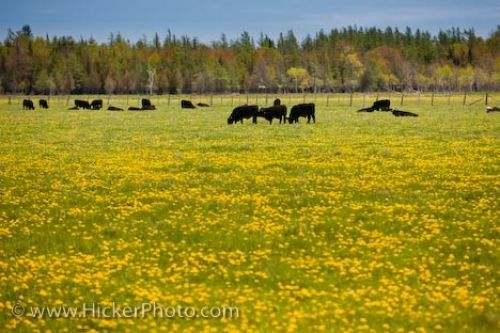 Bulls in a field of yellow dandelions on the Bruce Peninsula, Ontario, Canada. Picture of cows grazing on a farm in a field of dandelions on the Bruce Peninsula in Ontario, Canada.